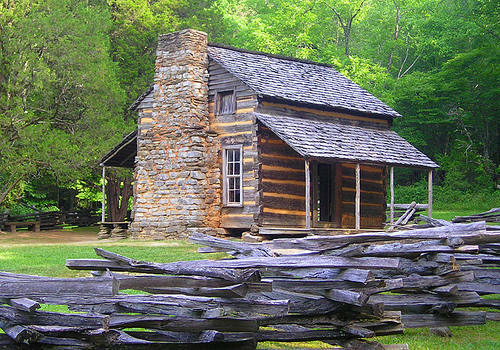 There is something special about a log cabin built by hand from natural materials. Equally special is the man or woman who undertakes such a challenge. 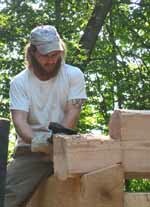 The logs, with their axe cuts and notches, take you back to a time long past when each builder’s skill showed throughout his dwelling. What character you will find in the distinct lines of the chinking between the logs, in the hand peeled porch railings, in hand made hinges and hardware. In an age of pre-made building materials where everything is perfectly square and symmetrical, a rustic hand built cabin shines like a light on a hill. Building your own log cabin will test you as a person both physically and mentally. You will find you have skills you didn’t even know existed. On this website, you can learn about all the phases of cabin construction including various wood types, notching styles, foundations, tools, roofing options and much more. Before I built my cabin, I was looking for people who have experience and information. I found very few live ones and only a few books. Most books were outdated. I was after details more than fuzzy black and white photos. You can find those details here! Log cabins to visit and explore are all around. You just have to know where to look. Some are preserved historical landmarks that you can tour inside and out, learning about the extraordinary pioneers who often built alone and with no electricity or power tools. 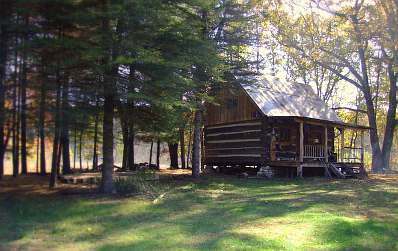 Other cabins are private residences. These you may have to admire from a distance - though it’s amazing what a knock on the door and some friendly compliments will do. When I am fortunate enough to meet an owner/builder, I often ask for advice about some small aspect of building and regularly get invited in for a tour…and an education! Take a look around this site and feel free to ask questions or send your comments and stories. Thanks for visiting!